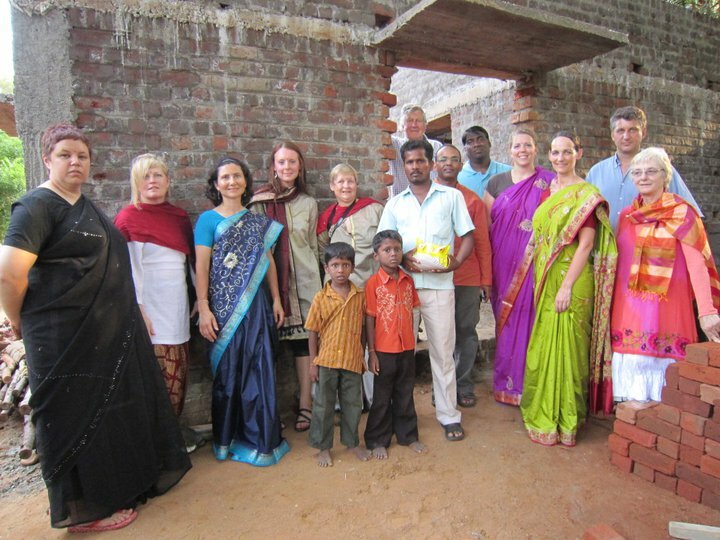 Over the course of our two weeks with the Habitat for Humanity Global Village Program in India, we worked on five different homes....it takes about 3 months to build one home. Here is a bit of information about each of them. 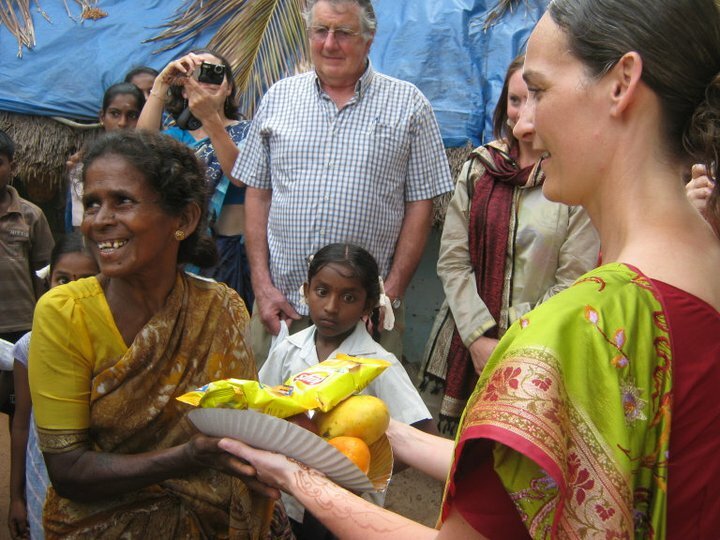 Kasiammal (35 years) is a widow and is residing with her two sons in Seyamkuppam village. Kasiammal’s husband Elumalai passed away three years ago. Kasiammal works for 100 days in a year in the National Rural Employment Guarantee Act scheme implemented by the Government. The family is residing in house where the roof is made of grass. The walls are thatched and the floor is cemented. Cooking is done outside the house. There is no toilet in the present house. There is corporation tap which 10 feet away from the house. The family uses this water for drinking, cooking, washing and for other chores. We met the mother during the first day of the build and after that she was not well....she had to have a cyst removed from her neck after the first week. Both son's worked very hard on the home and at least one of them was there everyday. We worked on this house almost everyday we were in the village and it was so exciting to see the progress throughout the two weeks....from nothing to partial walls!!! help us in the construction of our house". Seyamkuppam village. Manikandan (9 years) their elder son is studying in 4th standard in Tambaram which is close to Chennai. Nadhini (7 years) their second daughter is also studying in 4th standard in the Government school in Seyamkuppam village. The last son Bhoopathi is 3 years old and stays at home. (55 years) also stays along with this family. 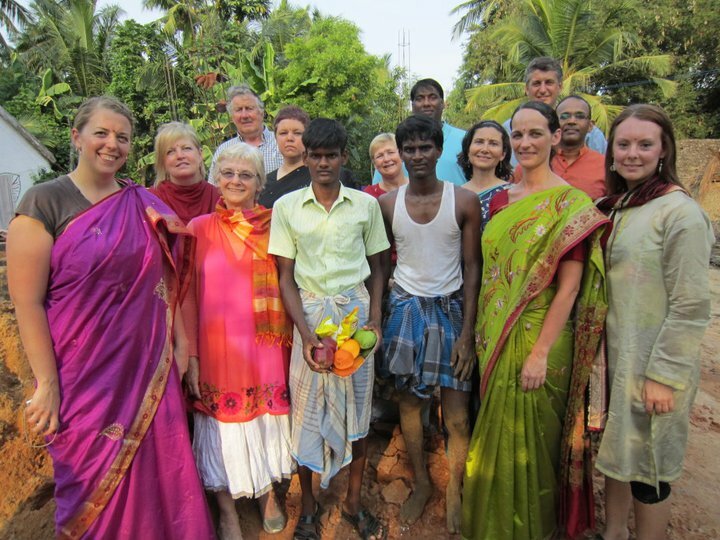 Murugan is involved in digging bore wells. Digging bore well is a seasonal job and Murugan get jobs only in the non rainy seasons. Anushaya works for 100 days in a year in the National Rural Employment Guarantee Act scheme implemented by the Government. This family has ½ acre of coconut grove and also has 3 cows and 2 goats. The family is residing in a thatched roof house. The roof is made of grass, flooring and wall is made of mud. Cooking is done inside the house. There is a bore well and the family uses water from this for cooking, washing and cleaning. We worked on this house during the first two days and the last two days of the build. We had a variety of people helping us from the grandmother, the wife and the wife's husband. We had red ants in one of the holes we were digging and everyday the homeowner would work on getting rid of them...and she finally did. The second day we worked at this site, the young son of the homeowner climbed a coconut tree to get us some coconut juice. The heavy rain we had in India washed away many of the holes we dug in the first two days and we had to fix them the last week so we could pour in the concrete base. Murugan says "I am sure the work of the volunteers is going to have a great impact on the cost of construction. I am going to save a lot on the labor cost and I want to thank the volunteers who are traveling so far to come and help me in saving the labor cost". We started to work on this house on our third day in the village. The husband of the homeowner was very specific about how he wanted sand to be sifted. This home was already started before we arrived...it was identified by REAL beforehand. There were many workers hired to do the masonry and painting. The homeowner and grandmother also worked everyday on the home. This home had the door and windows installed while we were there...the timing of this was based on astrology. It was very hot working on this home as there was never any shade!!! We started to work on this house during our second week in the village. It had been started when we arrived and we did a lot of brick moving here. I only worked at this site on one day when we knocked down a mud wall from their previous house, but I saw the homeowner on many occasions. This home was a duplex with the older daughter living in the second side of the house....she is just moving back to the village after separating from her husband. In the final days of our work here they started to build the walls for the bathroom. 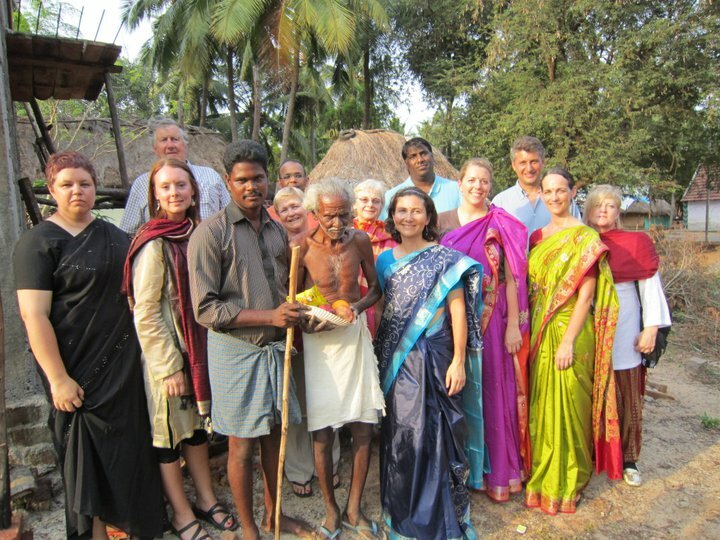 Dhanapal (80 years) and his wife Dhanalakshmi (65 years) are residing in Seyamkuppam village. This couple has 4 children. Out of which two of them are married and settled in the same village. 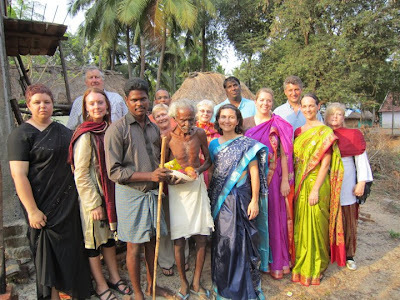 Palani (31 years) and Mohan (27 years) are the sons who are residing with the parents. 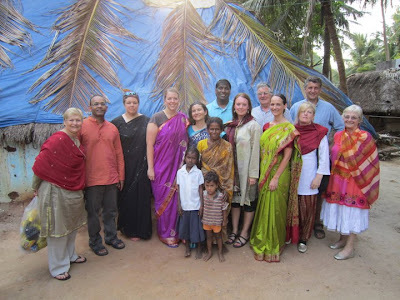 Jeyapriya (25 years) Palani’s wife also lives with her in-laws. Both the brothers Palani and Mohan work as electricians. Dhanapal also owns a two acre agricultural land. Dhanalakshmi takes care of the agricultural activities with assistance of her son Palani. There are 4 buffalo and the milk is consumed by the family itself. The family is residing in a thatched roof house. The roof is made of grass, flooring and wall is made of mud. There is no kitchen and toilet. There is a corporation tap near the house. The family draws this water from the tap for drinking, cooking and washing. Some times the family uses water from their neighbor’s house as they have a bore well. We only worked on this house for one day...the day of the lightning and thunder storm. We moved bricks from the road to the roof and then once it started to rain we moved bricks from the road to the side of the house. This house was already started before we arrived and we never met the homeowner. We did meet the husband and grandfather at the closing ceremony...this is when we heard he was over 80 years old and he was extremely proud to finally have a proper home during his lifetime. How incredible!!!! Palani says "we are waiting as a family to work with the volunteers".